Click the button below to add the Ah, Poor Bird by Traditional/Brew to your wish list. Description: "Ah, Poor Bird," is an arrangement designed to work on rhythmic variation. While guitar 1 features four iterations of the melody, guitars 2 and 3 feature four different rhythmic variations. Each time the melody comes back, the rhythm in the accompaniment changes. This piece is dedicated to the students in the Say Yes to Education Guitar Program in Syracuse, NY. 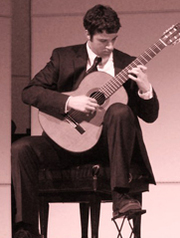 With a vast array of performances that include a tour of Spain with the Fredonia Guitar Quartet, a mini-recital in conjunction with the Great Lakes Guitar Society, and an appearance as a national semifinalist in the prestigious Schadt String Competition in Allentown, Pennsylvania, guitarist Stephen Brew has effectively established himself as a performer of incredible talent and ability. His musicianship has allowed him the opportunities to perform at the Rantucci International Guitar Festival as a member of the Fredonia Guitar Quartet, as well as at Fredonia State’s concerto competition, where Mr. Brew was selected as a competition finalist. His hard work and dedication is most keenly reflected in his recent acceptance into the doctor of musical arts program at the Jacobs School of Music in Bloomington, Indiana, where he has received a full scholarship. In addition to his performing endeavors, Stephen has been an active instructor of young guitarists. Mr. Brew currently works with youth guitar ensembles through non-profit organizations, community music schools, and supplemental education programs. He is in the process of co-designing a guitar curriculum with internationally-acclaimed guitar virtuoso Zaira Meneses, and his arrangements for youth guitar ensemble have been well-received. In the summer of 2012, Stephen was asked to assist with the youth guitar workshop at the Boston International Guitar Festival and Competition, where he helped prepare beginning students for a performance at the festival. Mr. Brew studied with Kenneth Meyer at Syracuse University and James Piorkowski at the State University of New York at Fredonia. He is currently a doctoral candidate at the Jacobs School of Music in Bloomington, Indiana, studying under maestro Ernesto Bitetti.